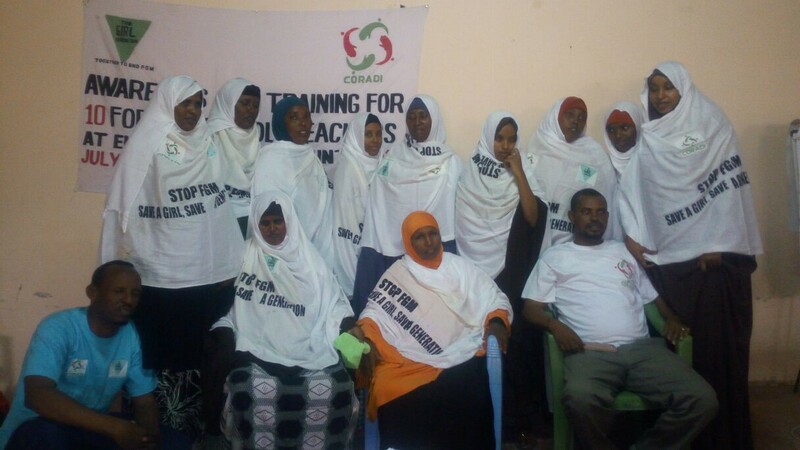 After receiving training from Community Resilience and Development International (CORADI) on the impacts FGM has on women and girls, community leaders and teachers in Mandera County, Kenya, have united to end FGM. Traditional cutters have also renounced the practice during training sessions and have become active end FGM advocates within their communities. In Mandera County, Kenya, 100% of girls aged between 15-19 have self-reported to going through the cut. Many of these girls go through the most severe form of FGM, Type 3 infibulation, which puts their lives at great risk. Community Resilience and Development International (CORADI) has been taking steps to end the practice of FGM in the region through training school teachers, sheiks (madrasa teachers), cutters and school girls on children’s rights and the harmful effects of FGM. CORADI has reached over 500 school girls and 10 cutters with the end FGM message. As a result of this outreach and training, these new advocates have been spreading the end FGM message to other people in the community in their own way. After the training, religious leaders came out strongly against FGM. According to Sheik Adan, ‘The daughters of Prophet Mohammed were not circumcised. This clearly indicates that FGM has no religious origin’. The sheiks have incorporated the training and information on child rights and anti-FGM messages in their madrasa sessions, reaching their congregations with these vital messages. Highlighting the effectiveness of the training was how many of the cutters in attendance have promised to abandon the practice and have become advocates against FGM. "Women in Elwak think that suffering is a normal part of their lives because they do not know life without pain since they were born. Little do they know that pain during monthly periods, difficult pregnancies and complications during child birth are all as a result of a harmful cultural practice performed on them during childhood." Kaltuma urged teachers, as the educated women within the community, to take on the responsibility of saving the lives of the younger girls who have not yet been affected by FGM. It is expected that the training of teachers, who are considered pillars of knowledge within the community, will have a big impact especially on school girls. "I did not know that I had so many rights as a child. I thought I only had a right to education which teachers had repeated many times." ‘We, the community leaders of Elwak, Mandera County and school teachers participated in the training organized by CORADI with support from The Girl Generation from July to August 2017 at Al Jazira Hotel in Elwak. We have learnt that FGM is a violation of children’s rights. We have developed an action plan that will enable us to take concrete action and bring significant change in the region. To this end, we make the following declarations on the 1st day of August 2017. 1. We condemn ALL harmful traditional practices and female circumcision of all types however small the procedure is as they DO NOT have religious ground and support. 2. We commit ourselves to educate the public in mosques, schools, and other convenient places about the baseless belief that female circumcision is a religious obligation. CORADI has shown that there is power in the training and sensitization of influential people within the community, and those that are directly affected by FGM. When different groups within the community join hands to fight against FGM, and communicate with them in an appealing and culturally sensitive way, there is hope that it will end in a generation.